Southern African leaders have called on Madagascar's rulers to allow exiled leaders, including the deposed president, Marc Ravalomanana, to return home. However, the country's administration is reported to have rejected the call. In a communique issued after a summit of the Southern African Development Community in Johannesburg at the weekend, the leaders called for the country to be urgently returned to "constitutional normalcy". Endorsed a "roadmap" to end the country's crisis prepared by former Mozambican president Joaquim Chissano, the SACC mediator on Madagascar. Called for "necessary amendments" to the roadmap. These were not spelled out, but news agencies said they would allow the return of exiles. Called for all those exiled for political reasons to be allowed to return "unconditionally." 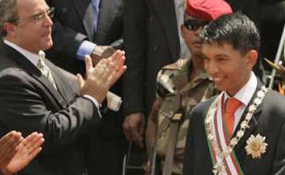 Madagascar has been ruled for the last two years by an administration under former Antananarivo mayor Andry Rajoelina, which seized power from Ravalomanana. On Monday Bloomberg News quoted Harry Rahajason, Rajoelina's minister of communications, as rejecting the return of Ravalomanana. "We will not sign an amended roadmap," Rahajason reportedly said. "We've already got our constitution." 8. On Madagascar, Summit noted the outcome of the meeting that took place on 6 and 7June, 2011 in Gaborone, Republic of Botswana, convened by the SADC Chairperson, H.E Hifikepunye Pohamba, President of the Republic of Namibia and H.E. Rupiah Bwezani Banda, President of the Republic of Zambia and Chairperson of the Organ on Politics, Defence and Security Cooperation, and H.E Joaquim Chissano, former President of the Republic of Mozambique and the SADC Mediator on the Madagascar crisis, as mandated by the Extraordinary Summit of SADC Heads of State and Government at its meeting held in Windhoek, Republic of Namibia, 20 May, 2011.